Mike Trout isn’t doing it alone this year. 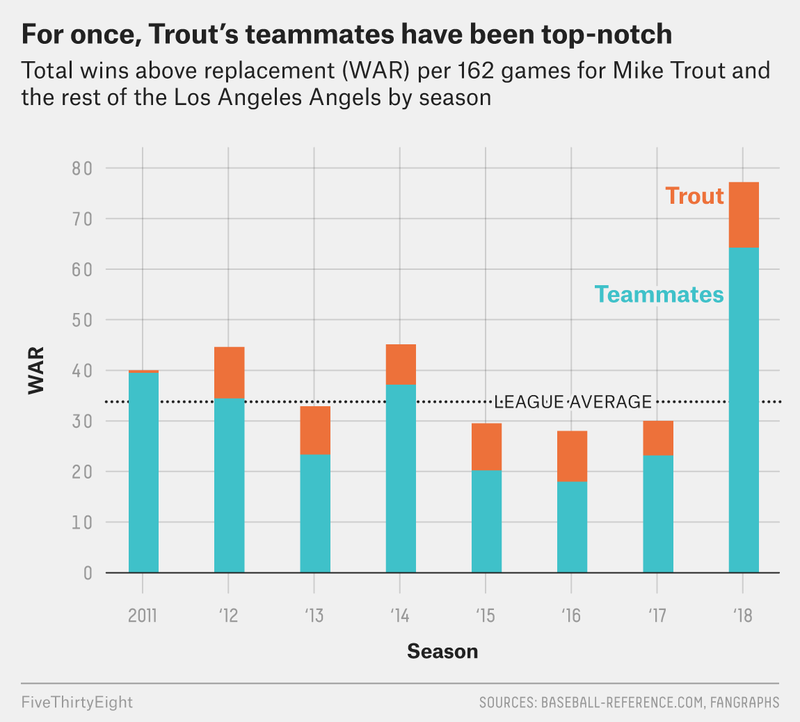 For years, the story of the Los Angeles Angels has been one of how far a singular talent — future Hall of Fame outfielder Mike Trout — could drag a group of otherwise unspectacular players. The answer was usually “not much further than 85 wins” — and even fewer in recent seasons. This year’s Angels are turning that narrative on its head, however, and it’s not just thanks to the emergence of two-way rookie Shohei Ohtani. Going into its game against the Boston Red Sox on Tuesday night, L.A. has begun the season as a case study in how successful a team can be when a player of Trout’s skill is finally surrounded by a handful of worthy teammates. Trout, of course, is just as good as ever. If it seems like we write about his otherworldly consistency every season, that’s because every season he somehow finds a way to keep adding to his legend. This year, Trout is once again the betting favorite to win the American League’s MVP award, and he leads the AL in Baseball-Reference.com’s version of wins above replacement (WAR).1 Once he gets that .244 batting average on balls in play straightened out (his career BABIP is .353), this will end up looking like a vintage Trout season — which is to say, the kind of year you’d expect to see out of the greatest player ever. The Angels have been spoiled by Trout for so long that it’s easy to take his greatness for granted. That’s especially true because he plays a sport in which the best player on the planet can really only improve a team’s record by something like seven or eight wins over league average in a 162-game season. LeBron James, by contrast, added about 20 wins above average to the Cleveland Cavaliers this season3 in roughly half as many games. While elite basketball players can carry mediocre teammates far, baseball’s superstars need more help. This year, Trout is finally getting that help. Last season, shortstop Andrelton Simmons was the only one of Trout’s teammates to play at a substantially above-average clip, according to WAR.4 But this season, Trout has 11 teammates on pace for 2.0 or more wins above average and seven on track for at least 3.0: Ohtani, Simmons, Justin Upton, Tyler Skaggs, Rene Rivera, Jefry Marte and Zack Cozart. Even the legendary Albert Pujols, who was infamously the worst player in baseball last season according to WAR, has been much better this year, tracking for a shade over 2.0 WAR per 162 games. Some of these early standouts are more likely to stay hot than others. In large part because of his outstanding work with the glove, Simmons has been one of the best (and most underrated) shortstops in the game for years. Upton5 and Cozart were very good last season as well. Ohtani’s stellar raw skills and versatility mean he’ll probably keep contributing throughout his rookie season. And Pujols’s hideous 2017 numbers might have been an aberration after all. Other players, such as Skaggs, Marte and Rivera, might fall off pace, given their track records. But even if a few of Trout’s teammates do come back to earth, this is still looking like the strongest Angels team Trout has had to work with in a while. Fittingly, no team has tacked more points onto its FiveThirtyEight power rating since preseason than L.A. has so far. It’s not like we’re rating the Angels ahead of the defending world champion Astros in the AL West or anything yet — Houston is still a solid 53 percent favorite to win the division. But Los Angeles should at least pose a fight. And that’s more than the challenger in this division has been able to say in a while: Over the past decade, no division has been decided by more games on average than the AL West, whose average winner was clear of the runner-up by 9.8 games per season. With Trout playing like, well, Trout, and his teammates giving him the support he deserves, the Angels look like a team to be reckoned with again. According to an average of Baseball-Reference and FanGraphs’ systems, which I prefer to use because it evens out the quirks of each method, Trout ranks third behind Oakland’s Matt Chapman and Didi Gregorius of the Yankees. But honestly, does anyone really believe either will be able to stave off Trout for long? One of which included significant time lost to injury. Using the same average between FanGraphs and Baseball-Reference’s numbers, Simmons produced 3.9 more wins than an average AL position player. Behind him among non-Trout Angels were pitchers Yusmeiro Petit and Blake Parker at 0.9 wins above average apiece. Who didn’t join the Angels until a trade at least year’s deadline.